NAMASTE – I think the following events will definitely allow you to find some ZEN 🙂 We have a wonderful lady – Sahaja who is visiting from Australia and offering 2 FREE Workshops to help you connect with your Soul and inner being. Clare, Monika and myself are offering a day of yoga in our: Yoga, Meditation and Mala Making Day and this day is being offered as a GrabOne Deal TODAY! Plus to encourage you into a regular yoga practice for – today – you can buy 5 or 10 session cards at half price. Tomorrow the bad weather is supposed to hit – so why not make the trip to the studio and hunker in with reiki, reflexology, crystals, free seminars, tarot & palmistry, live music and simply a great vibe. An invitation to meet your True Self through self inquiry, connect with like-minded people and give yourself the time to rest deeply in silence. A day of yoga with Whispered Secrets. Join Annie, Clare & Monika and experience Vinyasa (Flow) yoga, Yin Yoga, Pranayama & Meditation. Plus Clare will demonstrate and share her delicious Bliss Balls – full of wholesome goodness. 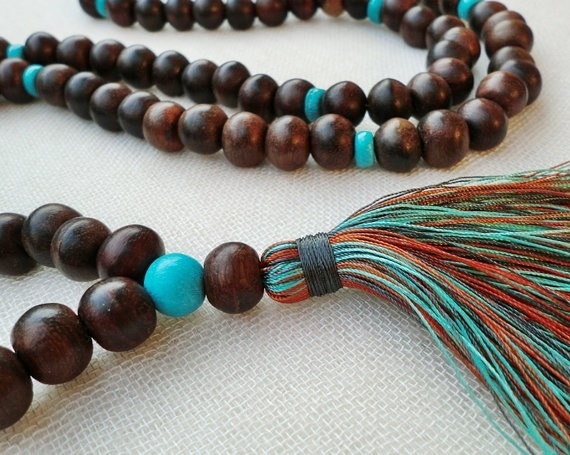 Annie will help you string your own mala (prayer beads) and guide you in their use. Monika will continue the Bliss theme with peaceful, healing Yoga Nidra (deep relaxation).